Do you like Brikki? 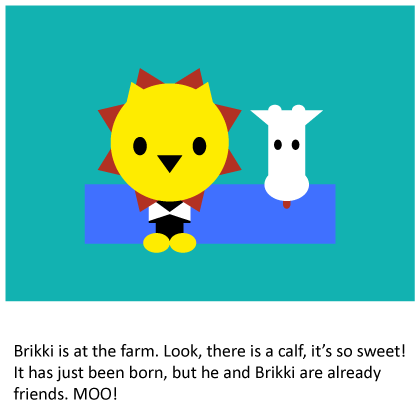 Become friends with Brikki! Then you can read a new story every day! 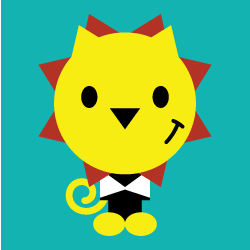 Why is Brikki yellow and red? Maybe different colors are much better? 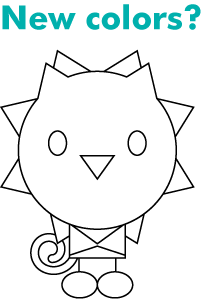 Try it yourself with Brikki's coloring page. 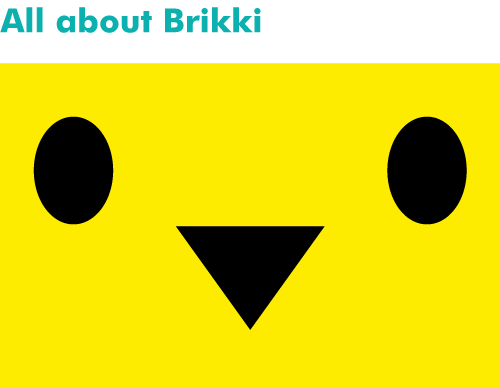 Do you have a question for Brikki? 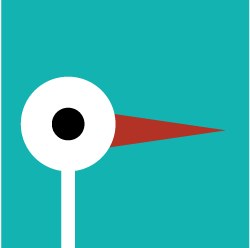 Good, because on this page you will find a lot of information on Brikki. So what do you want to know? Do you want to know a little secret? Well, making Brikki is quite simple. 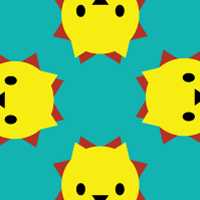 It's like this: just take some squares, circles and triangles... add some color... put the shapes in the right position and... there's Brikki! You don't believe it? Just look at this animation. 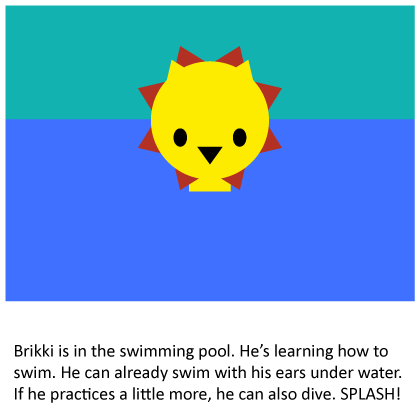 Or try it yourself, because here you can make Brikki yourself. Brikki was born in a funny way. Some time ago, Ingmar, Brikki's designer, was at an airport in a far away country. He had some foreign money left and looked for something to buy. 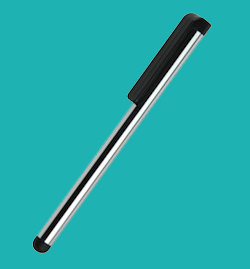 He chose a special pen he could use for his iPad. He thought it would be nice to make drawings with it. But when he came home, he found that drawing on the iPad was not as smooth as he had hoped. 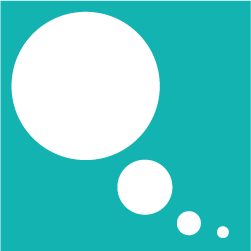 The only thing that worked nicely, was making drawings with simple shapes. 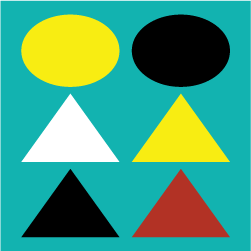 Yes, triangles, squares and circles. Ingmar often made drawings for his nephew Karsten and his niece Anna. 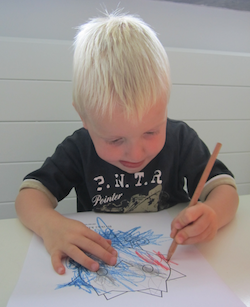 So he decided that his first 'brick drawing' would be a lion for Karsten. Because Karsten loves lions and likes imitating them ("WAAAHHH", he roares). And that's how Brikki was born, even though he didn't have a name by then. And he looked quite differently, can you see? A few weeks later Karsten and Anna visited Ingmar again. This is something they all like, it's always big fun being together. That day, Karsten surprised Ingmar with his lively imagination. Because he suddenly started telling stories about construction workers that had visited Ingmar's home, they had nearly changed everything in his house. And Karsten and his grandfather had helped them actively. This was... well, lets say... not entirely true. 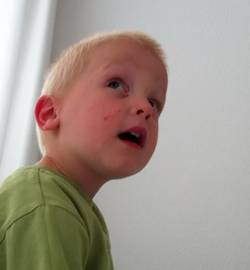 Here's a picture that Ingmar made during Karsten's story, can you see him fantasizing? That evening Ingmar thought: Karsten has such a lively imagination, I want to do something with it. Then he thought of the lion he had drawn on his iPad. He sent it to his computer and made a new version of it. And that's how Brikki was born, do you recognize him now? Next, Ingmar asked Karsten: "What do you think the lion is going to do?" Karsten liked the lion and said "WAAAH", but always answered with "I don't know that..."
Their partnership didn't start as smoothly as Ingmar had hoped. So he asked Karsten again a few days later. "Eating meat," Kasten answered finally. But Ingmar didn't feel this was such a nice idea for a story. So he listened well when Karsten told him what he had done that day. Karsten had been swimming and had dared to put his ears underwater, something he was quite proud of. That was a better idea than eating meat. So Ingmar turned this into a Brikki story. Karsten had also visited a farmer, he had seen a young calf, it had just been born. Another adventure for Brikki. Pictures say more than words, and suddenly Karsten understood. This was what he liked, he says something and the next day there was a drawing. His lively imagination was back again. 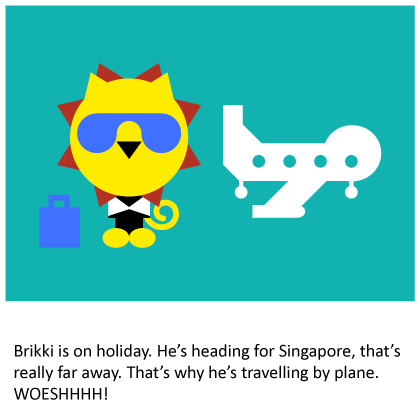 "Brikki goes to Singapore...", "Brikki goes by airplane...", "Brikki takes a bath", "Brikki is a construction worker.."
Suddenly, Ingmar had enough work for weeks. This was something that would work. Yes, they are a good team, the creator and the designer. They bring each other joy, and continuously surprise each other. 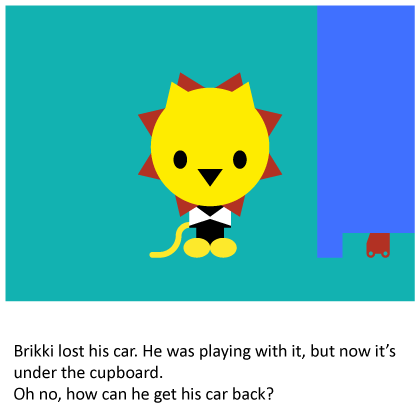 When Karsten saw the story below - "How can Brikki get his car back from under the cupboard?" - his answer was refreshing. 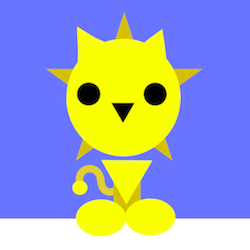 "Then Brikki needs hands, just like me... look..." He cheerfully started waving his little hands. That was an answer Ingmar could never have thought of. Karsten's sister Anna judges the stories. She's not even two years old, but she already has quite a strong opinion ;). Other children liked Brikki's stories as well. Therefore, Ingmar made this website, an eBook, and thought: "what if everyone who read Brikki, could also come up with a story?" The children liked this even better. They enthusiastically started drawing. Yes, really, you can create Brikkis yourself. 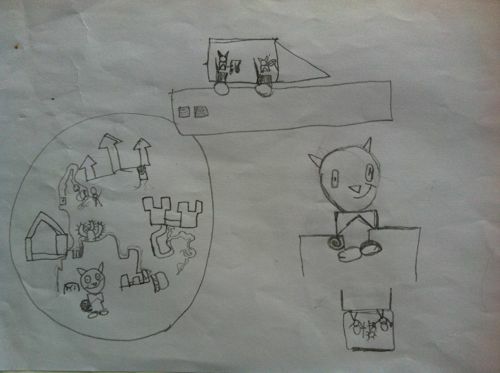 This is a drawing that David (6 years old) made. 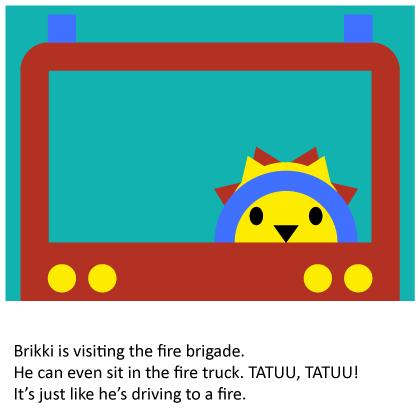 David's drawing was turned into this Brikki story. Nice huh? And you can do the same! So, do you have an idea for a Brikki story? Write it down or make a drawing of it and send it to hello@brikki.com. Or, even better, share it on Brikki's Facebook. Then other children can read your ideas and think with you! Karsten and Ingmar will turn it into a story. Your name will be next to the drawing! 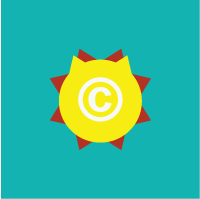 But wait, please read Brikki's rules, before sending an idea or a drawing. That's it! Thanks for your attention. If you have more question, please mail them. Karsten and Ingmar will quickly send you an answer, that's a promise.